Happy Mid Autumn Festival everyone. 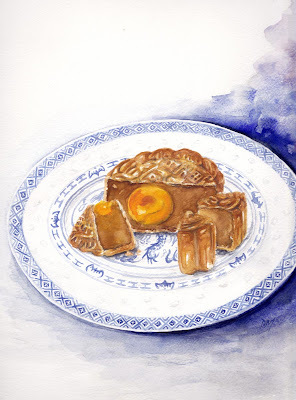 Is it caramel inside a mooncake? I had to look these up online because I'd never heard of them before and you made it look yummy. Ah yes! Mooncake! So yummy, and a super beautiful drawing of it too! Impressive detail in your work, esp. the way you managed to capture the intricate patterns of the plate and mooncake- in watercolour! Yum, Looks soooo Delicious. Great drawing,the plate too, is wonderful. Beautifully drawn and definitely looks delicious!